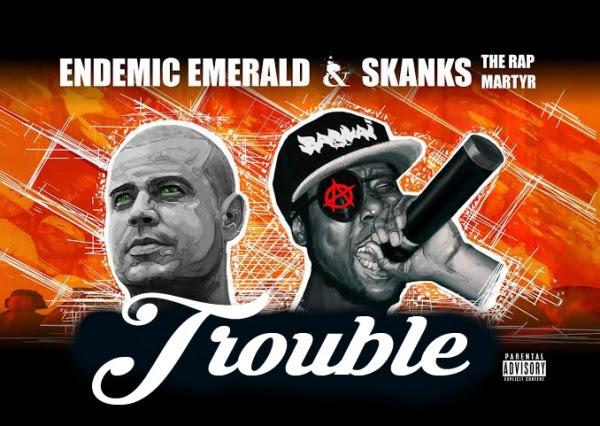 Endemic Emerald & Skanks the Rap Martyr present their collaboration album opus entitled ‘Rapsploitation’. Producer Endemic first met Skanks in Brooklyn mid-2013 when he first touched down in NYC. The duo built on the Nostrand Ave blocks & started to work instantly as they shared a similar stance on hip hop. ‘Trouble’ is the project’s lead single which portrays tales of US police taking innocent black lives. Skanks breaks down his frustration with the recent events while another Crown Heights O.G – Eric E-Class Wright intensifies the track with his vocals on the hook. Skanks is a founding member of Brooklyn’s Bankai Fam who released their debut, ‘On my side’, in 2013 & has also released an influential solo LP on French label; Shinigami records. At age twelve he was known as Problem Child & opened up for MC Lyte on numerous US tours, gaining accolades from many of the 90’s legends. Rapsploitation showcases Skanks as his finest delivering lyrics with substance over a diverse sound set from Endemic. Featured appearances come from Shabaam Sadeeq, Ruste Juxx, Tragedy Khadafi, Mic Handz, DJ Ready Cee, Darkim be Allah & Bankai Fam. The Album drops February 2016 via No Cure Records / IDC.